Don't buy a slot machine until you have read this book! 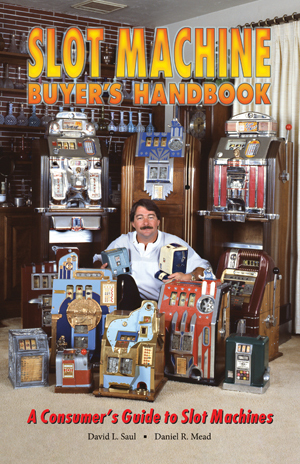 Slot Machine Buyer's Handbook (2nd Edition): The smart buyer is a knowledgeable buyer, and this amazing book tells it like it is. Every conceivable aspect of buying a slot machine is covered in depth. Strong and weak points of specific makes and models of slot machines, both old and new, are brought out and fully explained. The entire range of collectible slot machines is spanned from the earliest antiques to the hottest new casino models. Many are illustrated. Coverage includes the following, and much ,much more: How and where to find the best buys - How to select a slot machine that's best for you - How to determine a slot machine's condition - Which machines should be avoided - Specific models' performance history - Parts availability for various makes and models - Tricks used by fast buck artists to hide defects - Counterfeit machines and how to spot them - Foreign slot machines and how to spot them - Originality vs. value - How to detect non-original parts - Slot machine buyer's resource directory - What's legal and where - Which casino style slots are best for home use - Slot machine payout statistics - Buyer's comparison of over 950 slot machines - How slot machines work: mechanical, electric and the latest modern microprocessor types. With the Slot Machine Buyer's Handbook you'll learn how to buy "smart" and save a bundle. This book not only answers questions that immediately come to mind, but will also help prospective buyers gain the expertise and self-confidence that would otherwise be acquired only through years of experience. Avoiding just one costly mistake in the school of hard knocks will recover the cost of this book many times over. 100 photographs, charts, and glossary. 434 pages. 5 7/17" x 8 7/16", perfect bound with full-color, plastic-coated soft cover. 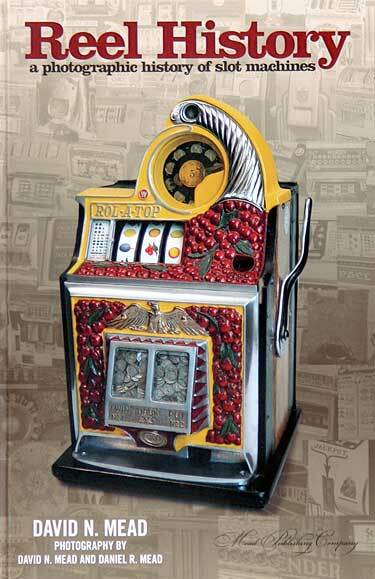 Slot Machine Buyer's Handbook..............Only $24.95...........Order yours today! Order on Amazon.com! or visit our eBay Store! An Identity Guide Like No Other..... Reel History, a Photographic History of Slot Machines: For over 25 years, people have been asking us, “When are you going to publish a picture book of slot machines?” Some wanted a coffee table book yet others wanted an accurate identity guide. Reel History is both books! Our goal was to produce a book, with large photographs in a small package. A book that everyone can own and display proudly in their home and library as well as use as a working identity guide. Reel History contains 436 quality black and white photographs, from the Mead Publishing Photo Library (some never before published), accurate identification by manufacturer, proper name, nickname and introduction date. It’s the perfect companion to the Loose Change Blue Book slot machine price guide. Printed on quality, heavy gloss paper, 456 pages, handy 5 ½” x 8 ½” format, perfect bound with a full color cover. Originally published at $39.95. Reel History..............Only $29.95...........Order yours today! Blue Book Slot Machine Price Guide: If your looking for slot machines, you need two things: an identification book and a price guide. Eighteen years of research is presented in this pocket sized price guide. Data has been obtained from many resources - sales, shows, auctions, collectors and dealers. This fourth edition contains alphabetical listings (by manufacturer) for nearly 2,850 slot machines and payout gambling devices from over 200 manufacturers - from 1893 to 1997. Each entry is accompanied by five prices, from brand new, out-of-the-box to clobbered and barely workable. Nearly every entry includes the machine's known nicknames, date of introduction, rarity, and other pertinent comments. This is the 1997-1998 edition. The Blue Book Slot Machine Price Guide has 368 fact filled pages, is fully indexed, measures 4" x 7/18", and is perfect bound with an attractive blue cover. Collector's Treasury Of Antique Slot Machines From Contemporary Advertising: While not pretending to provide exhaustive coverage of the antique slot machine, this 480 page volume does give a superb sampling of the advertising that appeared in The Billboard, a magazine long rated as the number one trade publication of the coin machine industry. Taken from issues dating over a period of 25 years, advertisements for such landmark machines as the 1937 Mills MELON BELL, the BALLY BELL and BALLY DOUBLE BELL of later vintage are included in the book's chronological arrangement, as are some devices that are to be found only in the ads, never having made it to production. As an identification guide, this book offers the most bang for the buck! Described accurately by the author as a "primary source book," Collector's Treasury Of Antique Slot Machines From Contemporary Advertising must be called gigantic - with 480 picture-filled pages. This one-of-a-kind book measures 6 1/4" x 9 1/4", and is hard bound with brown leather-like, foil stamped covering.Originally published at $26.95. Order on Amazon.com! or visit our eBay Store! Mills Of The Thirties Operator's Companion: This is the first in the Dan Post "Yesteryear Series", and contains reproductions of product brochures, service literature and advertisements, accompanied by a running narrative by the author to lead the reader through this exciting decade in the Mills Novelty Company's existence. For the person looking for the Mills Novelty Company's contribution to the "Golden Age Of Slot Machines," this is the hands-down definitive book. 192 pages contained in a hardcover, the book measures 6 1/4" x 9 1/4" with a metallic red-foil stamped cover. Originally published at $16.95. Mills Of The Forties Operator's Companion: Like its predecessor, this book by Dan Post, covers a decade in the history of the Mills Novelty Company, with special attention paid to its slot machine products. The period marked a change in the company's operations, as World War II saw a name change to Mills Industries Incorporated, and then, for its slot machine division after the war, the Bell-O-Matic Corporation, and the decline of slot machine production in the latter half of the Forties, as political jurisdictions began to legislate against various forms of gaming. This book is beautifully printed, with black and white illustrations reproduced with exceptional care. It measures 6 1/4" x 9 1/4", has a blue embossed hardcover. Originally published at $16.95. Watling Operator's Companion: The third Volume of the series by Dan Post contains the history of the Watling Company and its products with a narrative that is both informative and interesting, covering not only the account of the company's activities, but the personal activities of company founder Watling and his sons (although some of the information may well be apocryphal). This volume is superbly printed in black and white, with meticulous attention paid to reproduction of the illustrations. Measuring 6 1/4" x 9 1/4", this hardcover book contains 192 pages, and features a cream-colored cover with gold-foil stamped title and illustration. Originally published at $16.95. For Amusement Only: This combination book by Thomas Gustwiller covers a wide range of coin-operated amusement and gambling devices - about 500 of them. For Amusement Only is a handy pictorial reference guide for the rare and unusual machines that collectors have heard about, but have seldom seen. Impressive black and white photographs of machines range from single-wheel counter and floor-model slot and card machines to common two and three-reel models. And in between there are cast iron payout and cigar (card) machines, coin flips and drops, horse race and dice games, roulette and spinner games and many miscellaneous devices. Photographs average three to the page and each is accompanied by a specification block listing the name, manufacturer, date, estimated value, rarity factor and appropriate comments. As a bonus, For Amusement Only includes a machine listing originally compiled by Coin Machine Journal and a pictorial listing of the "Most Wanted Unfound Machines." Both are invaluable sources for historical reference. It is fully indexed, contains 248 pages, measures 8 3/4" x 11 1/4", and has a full-color plastic-coated hardcover. Mills Bell Machine Service Parts Price List With Supplement Parts And Service Manual: Actually two publications in one, this Mills HI-TOP booklet will round out your HI-TOP paper collection. This reprint was originally published in 1958, and covers all three-reel and four-reel machines, including the little-known four-reel FOUR CROWN machine with art deco styling. Eleven photographs and over a thousand parts with part name, number and price are listed. 11 Photographs, 20 pages. 8 1/2" x 11", attractive tan two-color cover, saddle-stitched. Order at our eBay Store! Pace Parts List & Service Manual: This booklet was originally issued in 1937 by the Pace Manufacturing Company of Chicago, the original manufacturers of the Pace slot machine. It contains a special photo section showing the ALL-STAR COMET, ALL-STAR SIDE VENDOR, ALL-STAR GOLD AWARD BELL, COMET FRONT VENDOR, DEFERRED-PAY FRONT VENDER, ROYAL COMET and the ARISTO scale. This authentic reproduction is filled with over a thousand pictured parts, all identified and priced (1937 prices)! 40 pages, 5 1/2" x 8 1/2". Bally Slot Machines 1964 - 1980: For over a decade, collectors have been predicting that the next collectible series of slot machines is the electro-mechanical series by Bally. These are the machines that revolutionized the slot machine industry, and marked the beginning of the end of Jennings, Mills, Pace and Watling. This handy reference booklet gives you a pictorial line-up of all the popular Bally electro-mechanicals from their introduction in 1964 through 1980, and adds a section on the E-Series, the immediate successor to the electro-mechanicals. Bally Slot Machines 1964 - 1980 is a logical companion to the Bally Owner's Pictorial Guide. 80 pages, 5 1/4" x 8 1/2", saddle-stitched with a full-color soft cover. Slot Machines - America's Favorite Gaming Device (6th Edition): Updated and recompiled sixth edition. Join Charles Fey, the inventor of the automatic-payout three-reel slot machine, as he introduces it in San Francisco in 1898. You will move with him - and his son, Edmund - through the Roaring Twenties and Prohibition, through the years of the Great Depression, and into today. Chronicled by Marshall Fey, the grandson of Charles Fey and son of Edmund Fey, the reader is treated to first-hand accounts of slot machines as they fit into each chapter of our nation's history. Perhaps best described as a "pictorial" book, Slot Machines belongs on the bookshelf of the serious collector and the coffee table of the hobbyist. Slot Machines features a printed and plastic-coated hardcover, measures 9 1/4" x 12 1/2", contains 256 pages, 504 full color illustrations and over 125 additional illustrations. Handbook Of Slot Machine Reel Strips: There has never been a published book of slot machine reel strip combinations with complete payout statistics - until now. This book is recommended to historians, collectors, enthusiasts and students. The heart of the Handbook consists of over 200 computer-generated charts which mathematically analyze various combinations of old factory-standard reel strips. Also included are various old casino combinations and patched versions, requiring simple punching of the discs on the lemon symbols in order to raise the payout percentages. The range is from 10 stops to 38 stops, from two reels to four; it's all here! The charts completely list the symbols in order of appearance on the strips, give the manufacturer's identification number (when available), and give detailed symbol-by-symbol payout percentages as well as overall payout percentages. With this book you will be able to establish a simple "Layout Code" for your machine's reel strips. This will permit you to quickly and easily look up this Layout Code in the Handbook and learn what you have probably already asked yourself: "What does it pay?" If you are mathematically inclined, there is a complete chapter on how to formulate equations for the computation of a slot machine's payout statistics. Other chapters explain how the charts were devised, with a detailed explanation, containing an example, on how to use the charts. The Handbook contains 296 pages, measures 5 1/2" x 8 1/2", and is perfect bound with a plastic-coated leather-like soft cover. 1910 Mills Novelty Company reprint, with Description of Machines supplement: Here’s a very well reproduced catalog from Ira Warren. Printed in full color, the main catalog illustrates the arcade and slot machines offered from the Mills Novelty Company at the time. What makes the catalog especially useful is the supplemental Description of Machines. Each machine is described as to how it operates and its specifications. A must have for collectors of early Mills machines. Color catalog, 32 pages tri-fold, self-cover, 5 ½” x 10 ½”; supplement, self-cover, 36 pages, 4 ¼” x 7 ½”.